These are high on my list, but I've read a few concerns about the 2 ply sidewalls. Any sway or squirm-ish feelings with them, when towing? I had the Coopers mounted and went straight to test pull our 5er back to the RV dealership for some upgrades. The first few miles I thought it feels like I am swimming. After breaking them in that feeling disappeared completely. What pressures have you guys found to be the best for these AT3 XLT's?! Cummins0867 and utahtrapper like this. Ive ran a set of the pros. I liked them for offroad and mud. Snow was pretty good especially deep snow, hard pack and ice youre always better off with an at tire. I found the pros to be louder than the old stt tire and the wear was on par with every other mt tire i have ran. My opinion is they arent bad but i wish they never changed the old stt tire. I had like 5 sets of those. 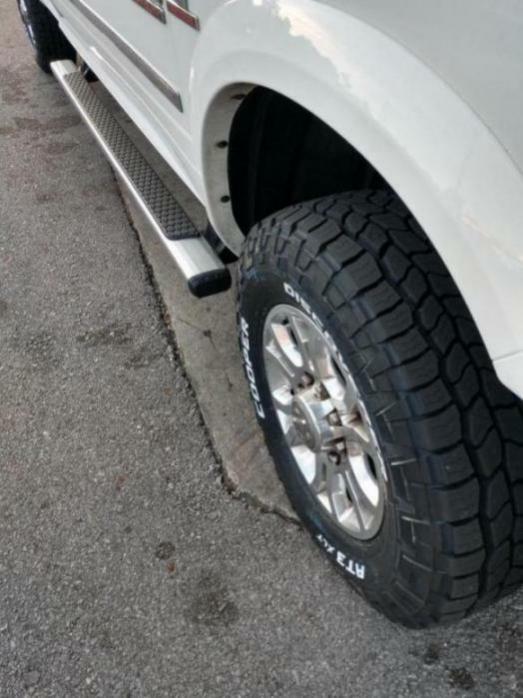 So when i bought new mt tires i went with the new yokahoma wich basically looks like they bought the old stt tread design and produced it as a new tire. I like to support cooper though, as an ohio boy... i will likely be shopping falken at3w against the cooper at3 xlt when my stockers wear out. I run the mt tires through the fall and winter for all the mud i get into. I'm also considering the Cooper AT3 XLT's or the Michilin Defenders. I currently have Continental Terrain Contacts and hate them. My truck is not on the road every day and they flat spot easy and ride terrible. I've been back to Discount Tire 4 times to have them balanced and they always show balanced, I went to the dealer and had them road forced and they show balanced. Get above 70 MPH and the whole truck shakes. This all started with the Continentals. Has anyone else experienced this? The only pro with the Continental is they have great traction off road and in the snow. They will go through snow better than any tire I've owned. Too bad it only snows 2 months each year in KC MO. 2014 Ram 2500, Laramie, Crew Cab Short Bed, Nav, Dual Alt, sunroof etc. 55k miles. bootsy1968, Suny, G. Mcpherson and 2 others like this. I was disappointed that white letters are not available in my size. Thank you for the shout out to your local Discount tire store. As long as you like the white letters out is all that matters. 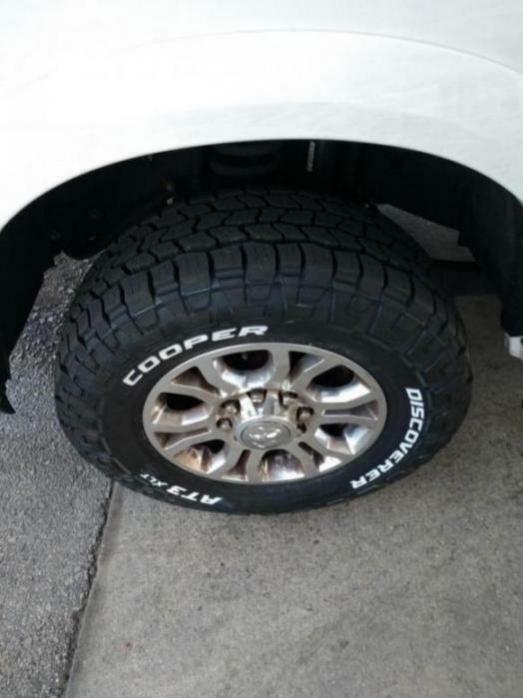 Please let us know your thoughts on the Cooper AT3 XLT tires when you get a chance. I've had my 295/70R18 AT3 XLTs for about 2000 miles. So far, so good. Comfortable, crazy quiet on the highway, and I have to give a shout out to Discount Tire Direct, because this is the first time I've had a set of aftermarket tires/wheels perfectly balanced on the first try. For daily driving, I'm running 60F/53R. Below that, things felt a bit bouncy for my taste. I haven't towed yet, maybe in the next week or two. Im about 6k in on mine and I agree with everything! I love these tires and they look amazing too! I couldn't be habppier and dont plan on buying any other tire until something proves better! Also, same about DTD, they nailed my balance as well first try and I haven't had to mess with them sense. Buying these and method wheels, balanced correctly, cured my highway vibration issues all together! Still trying to find my happy zone with pressures. Seeing all the comments about guys running 60-65 makes me curious. Mine say Max Pressure Cold 50psi.. I have 37's though so maybe that makes a difference. With 37s you are in the "flotation" tires. I don't really know what that means besides it uses standard instead of metric, but do know their max psi is lower. 35s are the same. Most of the LT metric sizes have a max psi of 80.